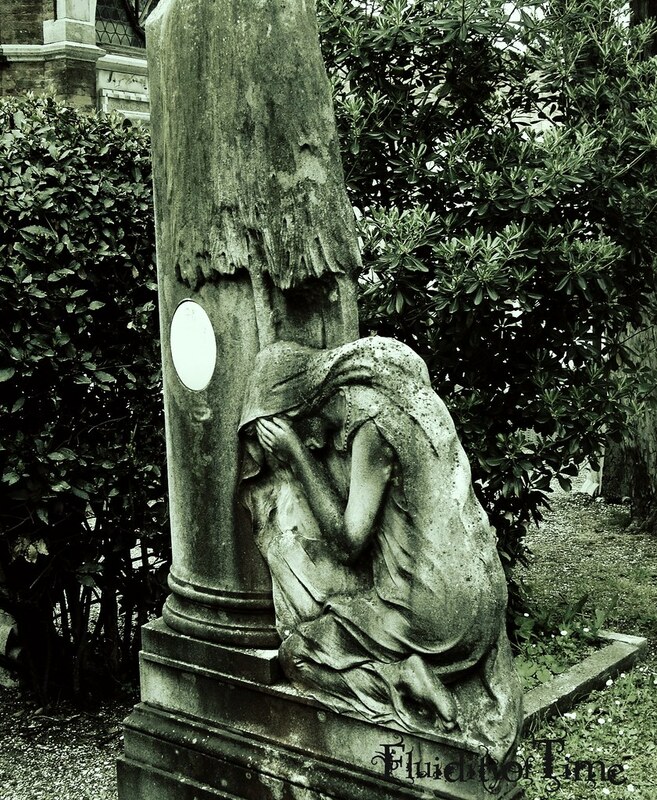 I took this photo on Isola San Michele, the cemetery island of Venice, Italy. I also did a bit of modification on Flickr to darken it. Visit and enjoy more Taphophile Tragics ! 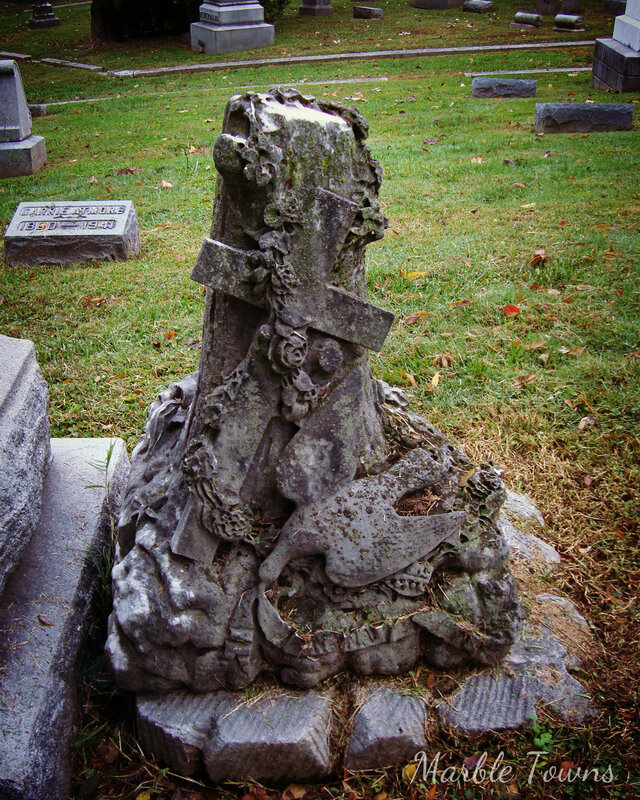 There are a number of Bristols buried in the Naperville, IL cemetery. Many of them are tied to Hiram Bristol, who lived from 1800-1894, and who was the town assessor in 1852. 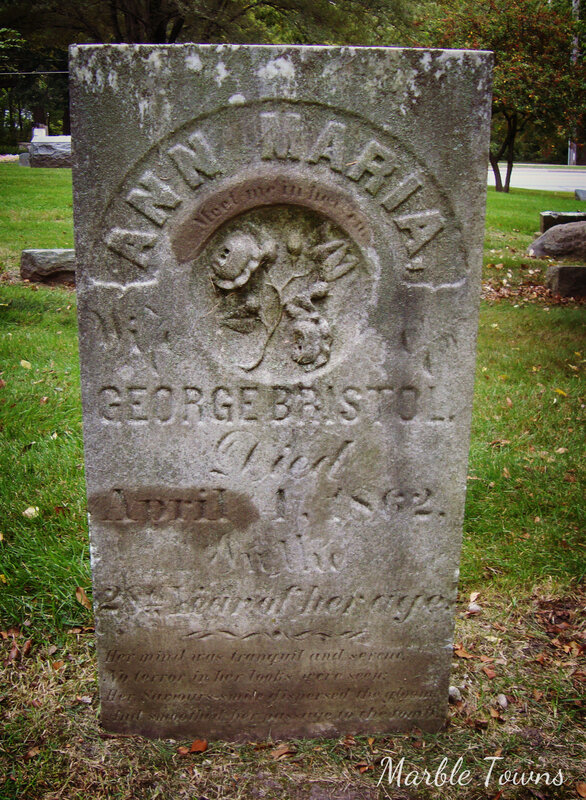 This is the marker for Ann Maria Bristol, who was born in 1834 and died in 1862. 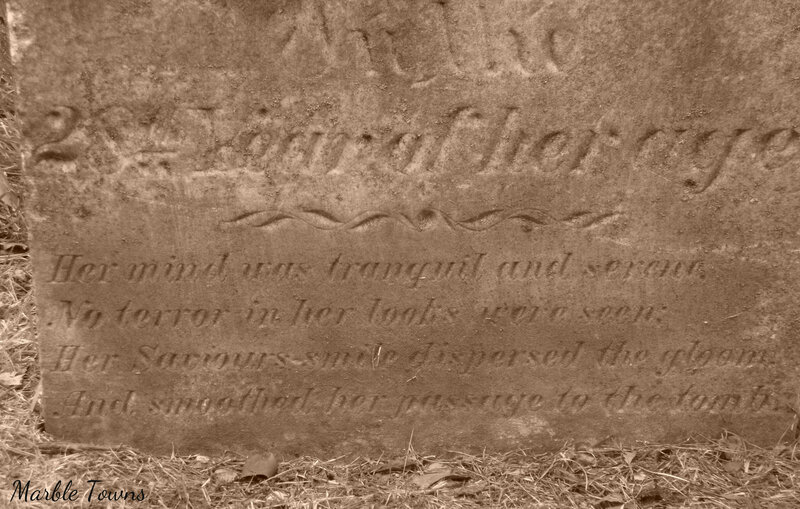 She was the wife of George Bristol, who is not related to Hiram Bristol, and who is not buried in this cemetery. 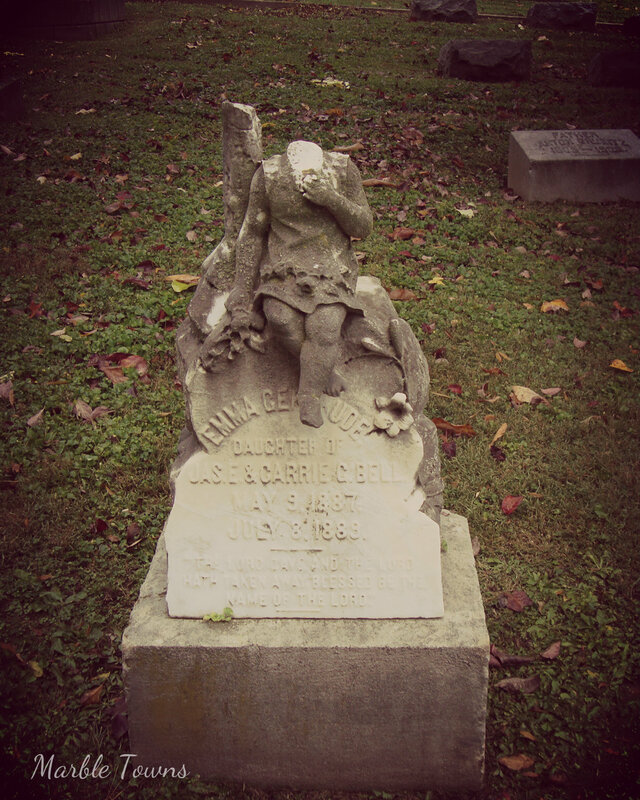 According to what I found, Ann Maria Bristol was the daughter of Daniel Heath Orcutt and Anjeline Perkins Orcutt, who are also not buried in this cemetery. I’m not sure what happened to Ann Marie, and why she died at the age of 28. The record I found shows she had a child in 1859, who died at the age of 9 in 1868 (this link shows someone else’s photo, with a flat stone next to Ann Marie’s, which appears to be that of her son). Whatever the circumstances, someone loved Ann Marie very much, as evidence by the carvings on her stone. Was General Passenger Agent of the Louisville and Nashville LOUISVILLE, May 29.-Charles Pawson Atmore, General Passenger Agent of the Louisville and Nashville Railroad, dropped dead in his room at Forth and Chestnut Streets, this afternoon. His death was due to apoplexy. I’m not sure if this was the original marker, and then the larger one was erected later, but that certainly seems like a possibility. I looked up the symbols, and my book shows the dove is a frequent symbol, usually shown holding an olive branch. Here, it looks more like it’s holding a ribbon, but I assume it’s still the same symbolism of purity and peace. The amount of careful carving of the flower garland is still evident. Interesting, there is a town in Alabama which is named for him. According to what I found about historical markers in Alabama, “In 1897, town leaders wanted to change the name of Williams Station to Carney, in honor of William Marshall Carney, the man who had contributed greatly to the town’s growth. However, Mr. Carney’s brother had already started a settlement in Baldwin County and given it his family name. Having two towns with the same name so close together would create confusion. Determined to honor W.M. Carney, the leaders asked him to select the town’s new name. He honored his good friend, Charles Pawson Atmore, general passenger agent for the Louisville and Nashville Railroad in Louisville, Kentucky. According to the New York Times, C.P. 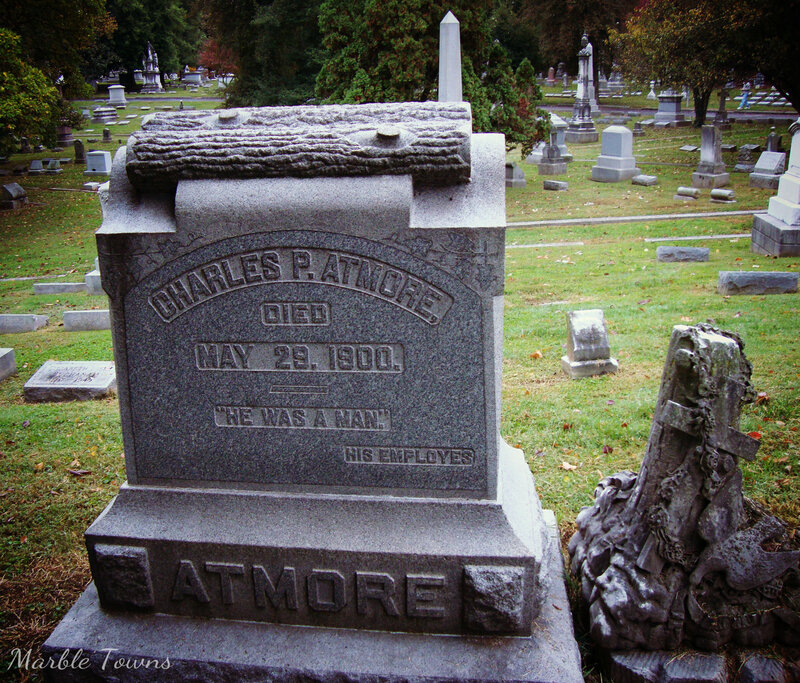 Atmore died at age 66, on May 29, 1900. There is no record that he ever visited the little town named for him. On May 23, 1907, Atmore became an incorporated municipality. The town celebrated this centennial milestone at Heritage Park in May 2007. 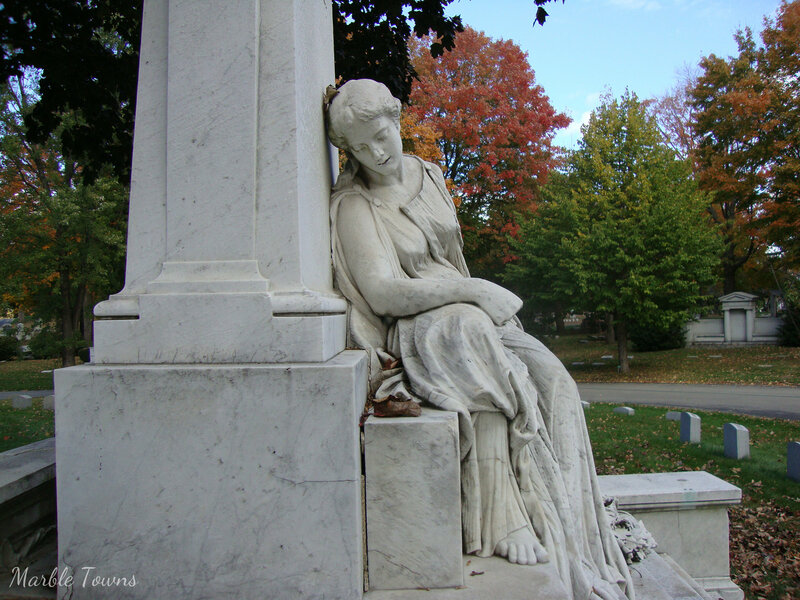 Her parents were Alice Catherine Stokes Harrison, who was born in 1848 and died in 1881 at the early age of 33, and John Stewart Harrison, who was born in 1842 and died in 1901. According to the records I found, John married again — and married Harriet Bonnycastle Cooper (1866-1942), and they had three children. Interestingly, Alice Catherine Stokes Harrison came from a large family. Her parents, William Henry Stokes (1809-1874) and Prudence Catherine Ward Stokes (1816-1859) had 9 children (although some of those children died at an early age). 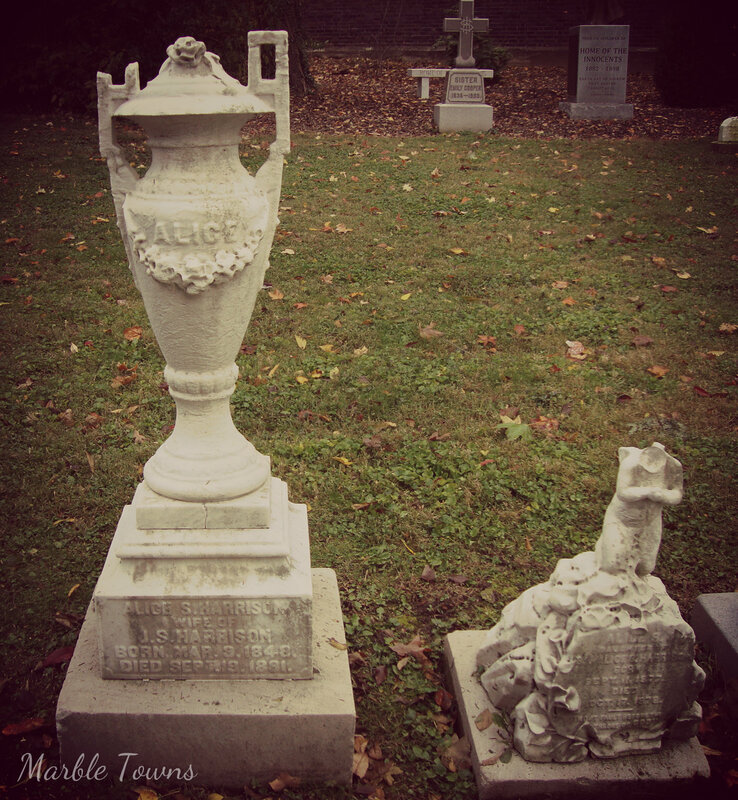 The family names of Stokes, Harrison, and even Bonnycastle, seem to be rooted in the Louisville area, and show up numerous times in the Cave Hill Cemetery. 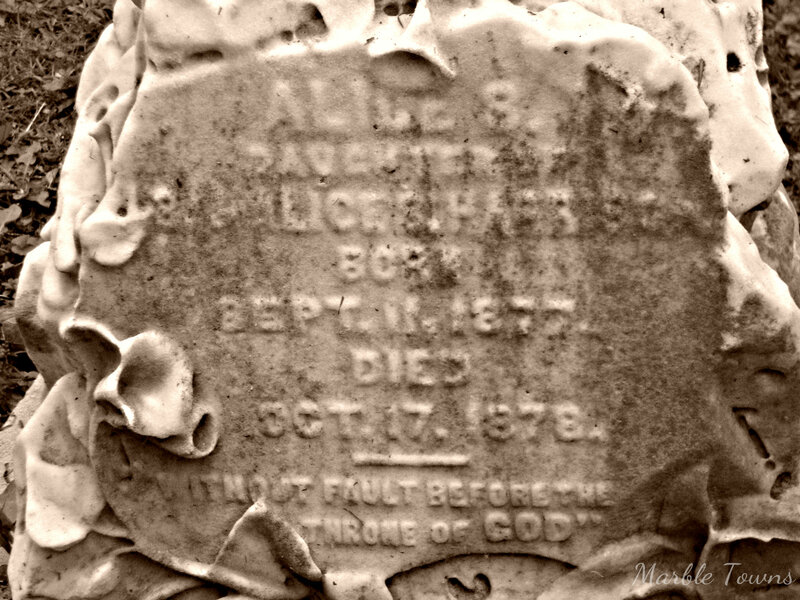 This is one of my favorite finds from the Forest Home Cemetery in Milwaukee, Wisconsin. 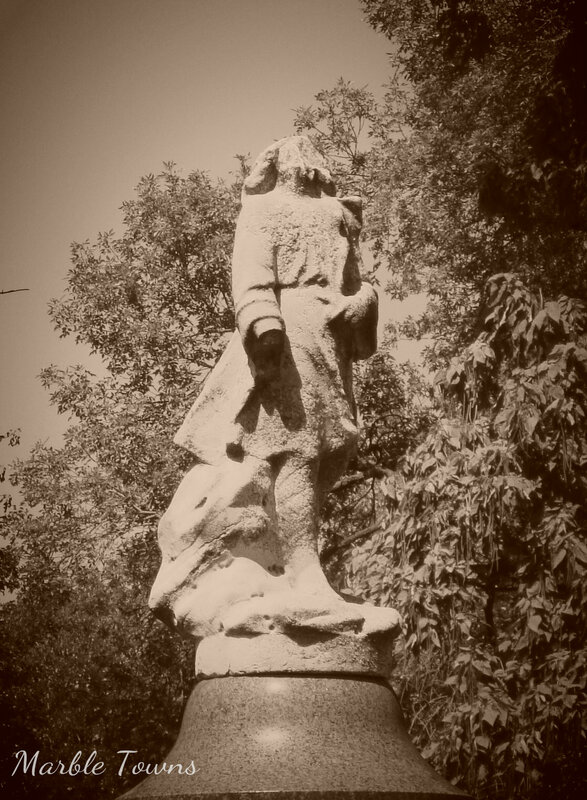 This cemetery is huge, and there are many, many figures (which I’m sure I’ll be putting into future posts). 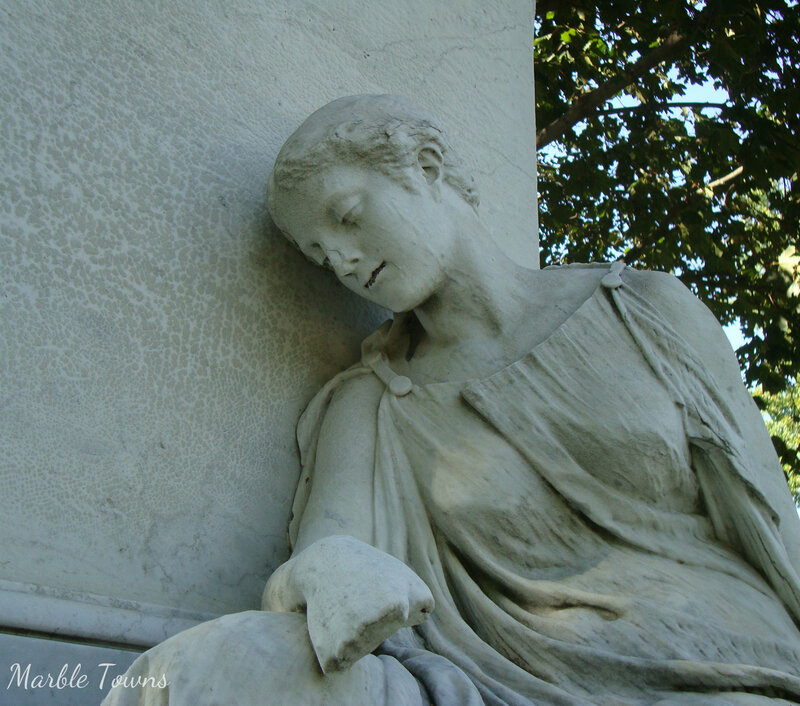 However, I found this particular figure to be particular touching, and have photographed her from many angles. And he wasn’t just known for beer — he was active in the community and was a civic leader. He established Milwaukee’s Pabst Theater, which is still in use today, and he had also established a traveling library providing German language books for immigrants. There are family markers in front of this memorial, for members of the Pabst family. 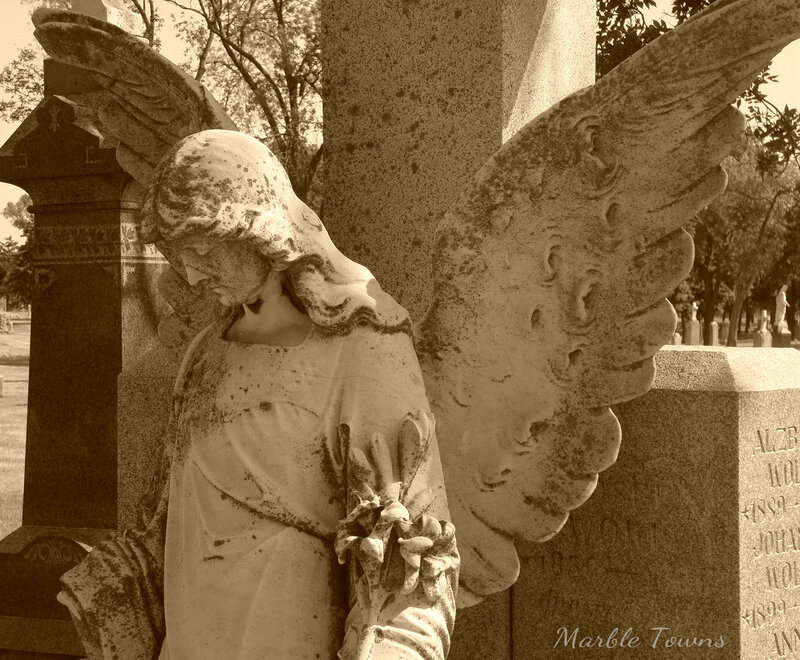 I had an opportunity to visit Cave Hill Cemetery in Louisville, Kentucky this past weekend (and have now sorted through the 200+ photos I took…..). This is one of the most well-preserved cemeteries I’ve visited (and I’ll be posting more about it in the next week or so). 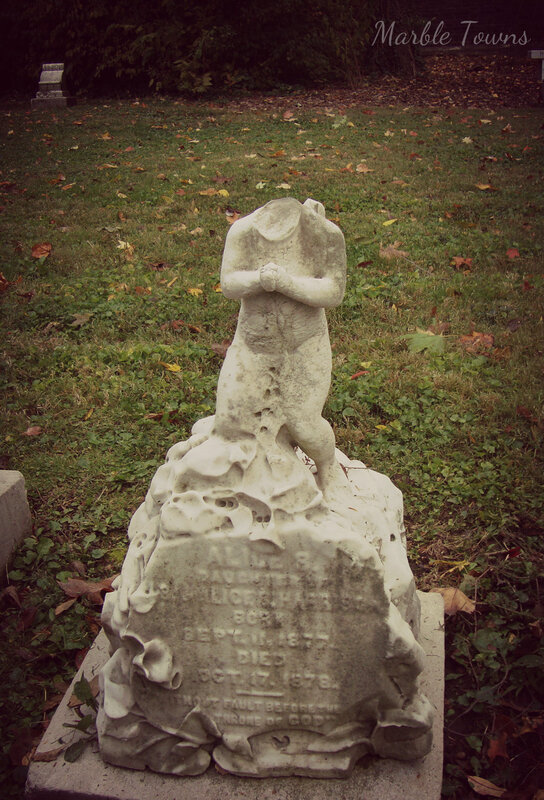 In keeping with my October-Halloween-spooky things theme this month, I’m posting this picture of this poor headless girl. This poor figure has lost its head … literally. She is also missing part of a hand, poor thing. 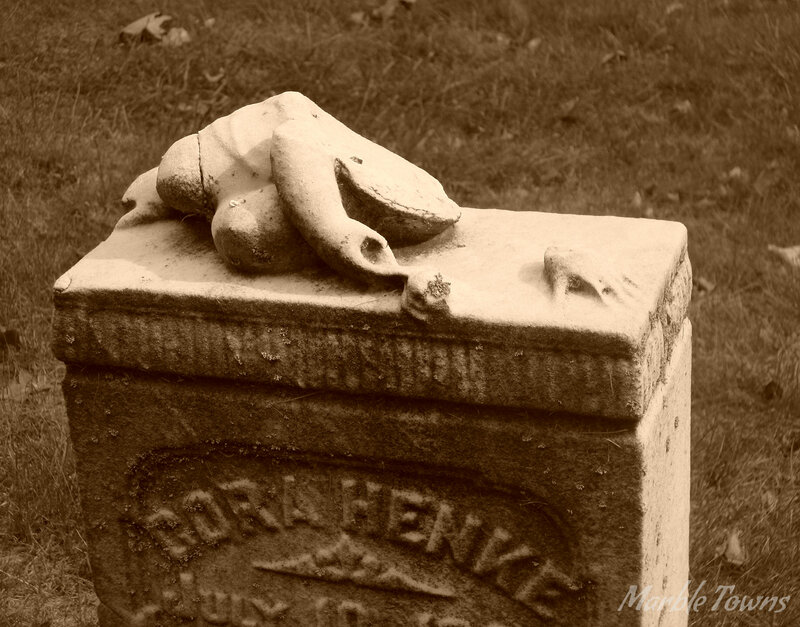 No head or hand was found near this figure, which resides in Forest Home cemetery, Milwaukee, Wisconsin. Which would be the hand, sitting by itself. At least someone took the care to leave the hand where it’s close to the angel. 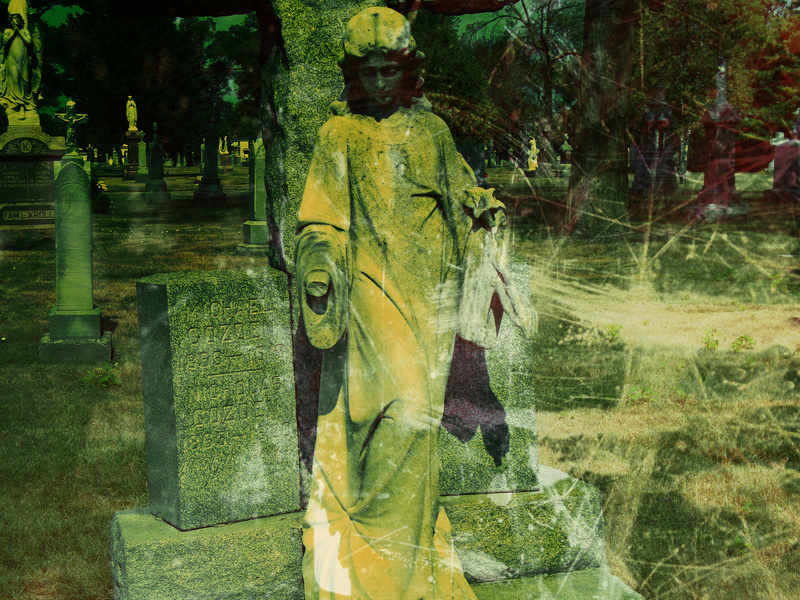 I see a lot of cemetery photography pop up around the blogosphere as we get closer to Halloween — which makes sense, since some people consider cemeteries to be spooky places. 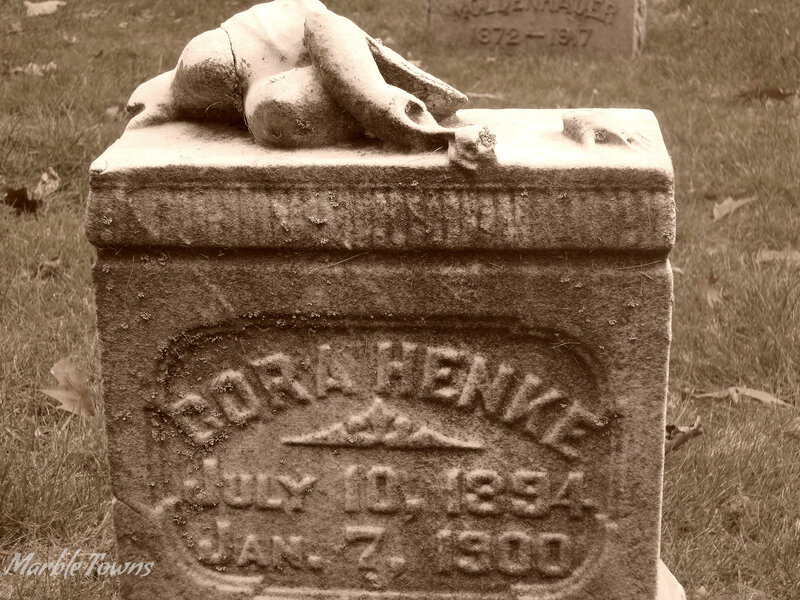 I came across this marker for Cora Henke in Forest Home Cemetery in Milwaukee, Wisconsin — and the thing that I noticed first wasn’t just that the figure has suffered a lot of damage, but that because of that damage, there is a small, disembodied hand off to the side. 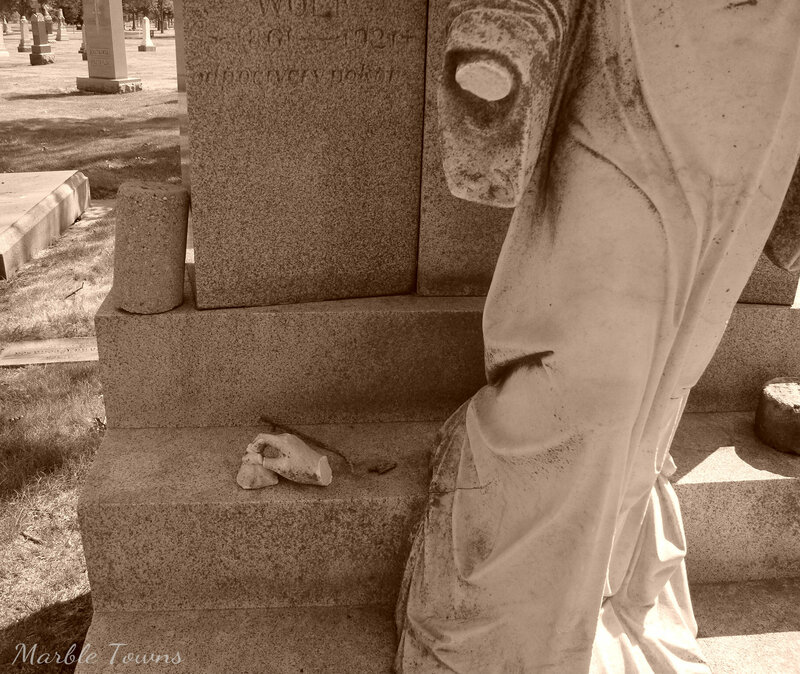 I used a sepia tone to modify these photos, so it’s clearer to see what the little hand looks like (as well as what’s left of this figure). I suppose it is a little spooky, to have this small hand off by itself …. 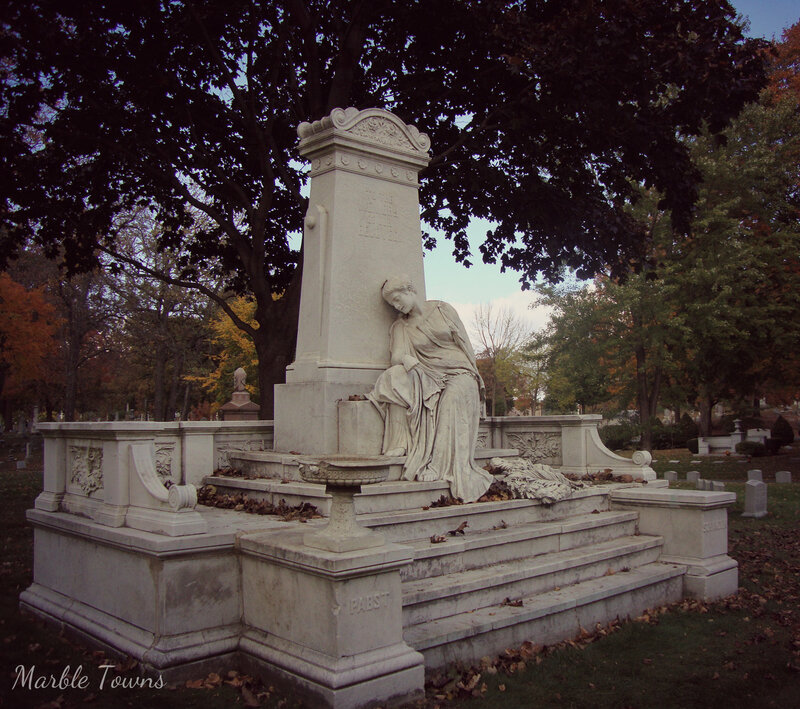 which is why I’m including these photos for my October posts. 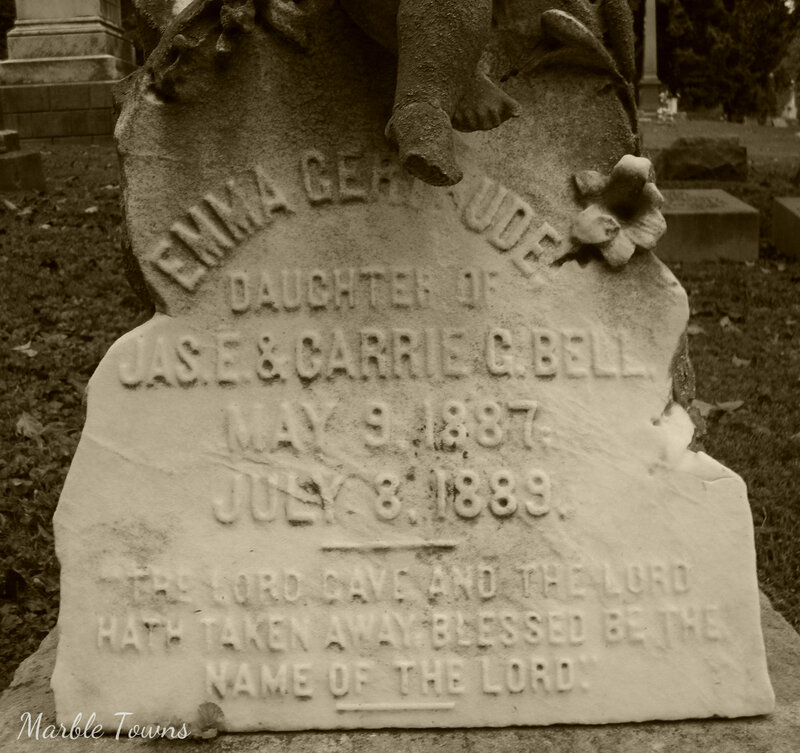 As you can see, Cora was a child when she died, and I assume the original marker was a figure of a child.